At Lake Tahoe, you can find ski resorts that grew up around Olympic ski runs, family-focused places that offer childcare and kid-centric activities, places with views so stunning you might forget to start your downhill journey, and places that snowboarders love. If you're trying to find the perfect Lake Tahoe ski resort for your trip, it depends on your skiing style - and what part of the lake you want to be near after hours. Below you'll find the best places by type. You can also find links to a ski resort map and to each of the resorts mentioned here in the section at the end of the article. Ski magazine once called Northstar-at-Tahoe the "epicenter of laid-back family luxury" and it's Lake Tahoe's undisputed champ for a family ski resort, with a childcare center for kids two to six years old. They don't have to be potty trained, and they take the kids for full or half days. Parents receive pagers so they can be alerted if something urgent arises. For after-skiing fun for the whole family, Northstar has a bungee trampoline, an ice skating rink, tubing, and outdoor fire pits for making s'mores. Squaw Valley was the Winter Olympics Committee's choice for the 1960 games. Today, it's still one of the largest ski areas in the United States and an extreme skier's paradise with expansive, steep terrain. Tight chutes, KT-22 peak, and Moseley's Run's non-stop 2000-foot vertical feet descent are enough to challenge even the world's top skiers. But don't be intimidated. Intermediate and beginning skiers will find plenty to enjoy here, too. Northstar-at-Tahoe has a terrain park that's the best at Lake Tahoe according to BayArea.com. If you want to learn more and learn it faster, you can enroll in their Burton Snowboard Academy. The pros like it too: The USASA National Snowboarding Championships and Van's Pro Snowboard Invitational have held their events at Northstar. Try Heavenly at South Lake for long snowboard runs and great views. It may not be the best place for beginners but is good if you have some experience. Heavenly offers a panoramic view of Lake Tahoe and the surrounding mountains. In fact, the vistas are so beautiful it's a wonder anyone can ski without stopping to gawk at their surroundings. Ski magazine says: "Heavenly’s brand of high-energy skiing is a unique mix of big terrain (4,800 acres), lake views, and Vegas-style partying." Heavenly's South Lake Tahoe location also makes it the best place to combine skiing and nightlife. That is if you have any energy left for partying after a day of skiing. 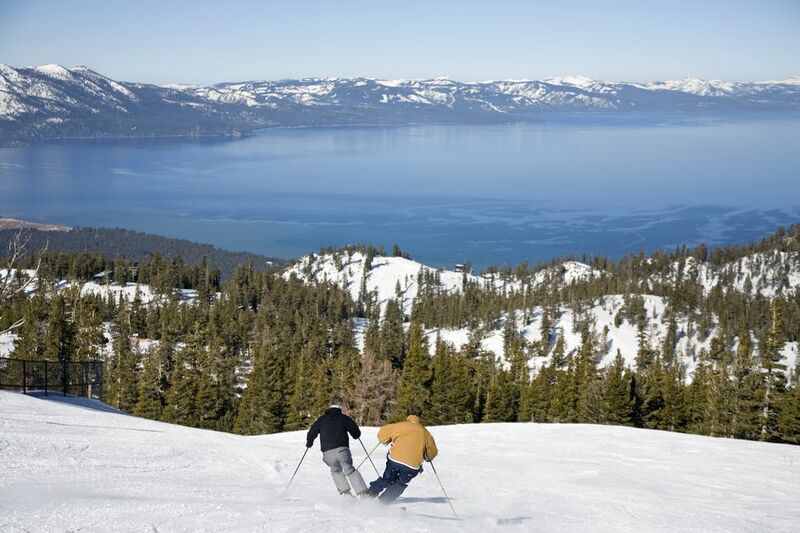 The list above sorts the resorts by type, but you might also be interested to know that readers at onthesnow.com rate these Lake Tahoe ski resorts best overall: Kirkwood, Squaw Valley and its sister property Alpine Meadows, along with Heavenly. Soda Springs is the first resort you will reach when traveling east on Interstate 80 in California, right at the Donner Summit. It's a small Lake Tahoe ski resort that offers skiing, snowboarding, snow tubing, and mini snowmobiles for the kids. It can also be a cost-saving alternative to the larger Lake Tahoe resorts, but visitors' opinions about it are split. Read both positive and negative reviews on Yelp and also check what people have to say on Tripadvisor before you decide to try it. Squaw Valley is also outside the mountains that ring the lake, a bit farther from it than Northstar. You can find more details about it on the Squaw Valley website. You can find about the hotels at Squaw Valley here. You can also read reviews of Squaw Valley on Tripadvisor and reviews of Squaw Valley on Yelp. Heavenly is located at South Lake Tahoe, with its ski runs just above the town. You can find plenty of hotels in the area, along with casinos (on the Nevada side of the border) and restaurants. You can find more details about it on the Heavenly website. You can also read reviews of Heavenly on Tripadvisor and reviews of Heavenly on Yelp. Alpine Meadows is just south of Squaw Valley and they are operated by the same company. You can find more details about it at the Alpine Meadows website. You can read reviews of Alpine Meadows on Tripadvisor and reviews of Alpine Meadows at Yelp. Soda Springs is a smaller resort and the first one you get to when going to Lake Tahoe from San Francisco or Sacramento. You can read more about it on the Soda Springs website. You can also read reviews of Soda Springs on Tripadvisor and reviews of Soda Springs on Yelp.